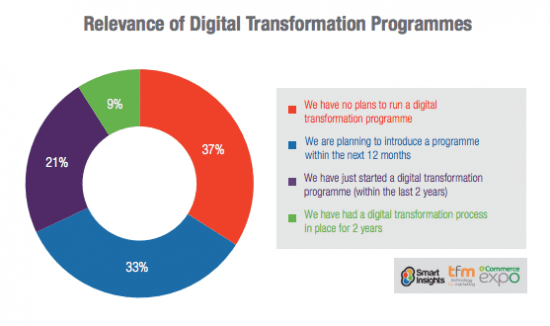 Chart of the Day: How popular are Digital Transformation programmes? 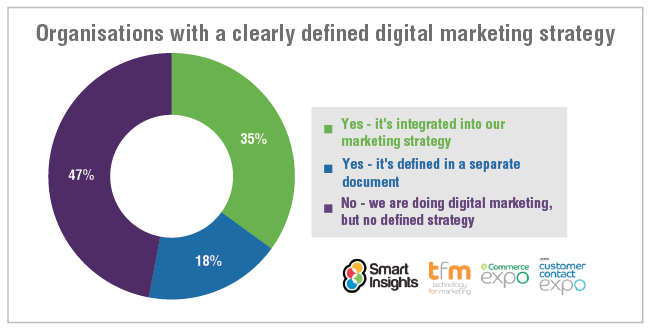 Our Managing Digital Marketing 2017 research reveals many challenges for how digital marketing is run by companies today. Problems included lack of focus on integrated strategy, testing and optimization and structural issues like teams working in silos or lack of skills in integrated communications. To counter these types of problems and so make the most of the opportunities for growing a business through digital marketing, many businesses are now putting a digital transformation programme in place. The chart shows how many are active in transformation. You can see that over one-quarter (30%) of businesses already have a transformation programme in place, with many businesses looking to launch their digital transformation programme imminently. A significant proportion of organizations have no intention to implement a programme, perhaps because they feel it is inappropriate for their type of business, for example, startups and smaller businesses or businesses who are online pure plays. If you’re considering launching a transformation programme, see our guide for Business members to Managing a Digital Transformation programme.